There is absolutely little if any accurate prediction of athletic success post-puberty by how kids play during pre-puberty. In other words baseball success pre-puberty cannot automatically be forecasted for children 13 and older. We do know that statistics tell us 75% of youth are out of organized sports by age 14. Just because someone makes all-stars or plays travel ball at age 8 through 12 years old does not necessarily mean a kid is going to still be playing in their high school years. College baseball scholarships are few and far between anyway (divided into 1/4s) much less professional contracts. Baseball pre-puberty should look like fun, playing and learning. Youth practice is the time for learning. Baseball practice for kids should also include fun and playing, too. That is what pre-puberty baseball should look like. Include fun, simulated practice games, and learning in every practice. All this can be done locally in the rec leagues and informal baseball practices. We do not need to travel to Ten-Buck-Tu every other weekend when we can do the same thing and get the same results locally. Winning-at-all-costs approach never turns out well. All-Stars rarely turns out too well. Almost always we experience increases in our stress levels and become frustrated as a family. It seems we too often get a coach that is very nice to the kids but cannot teach baseball; or a really mean, obnoxious coach that wants to win the World Series every game. Why put us through the misery of organized leagues and travel ball when there is a better way. Stay Tuned! Want to have a blast with your kids? Just play catch with them. There is no doubt that playing baseball at home or away from organized teams is a tremendous way to become a better ballplayer. 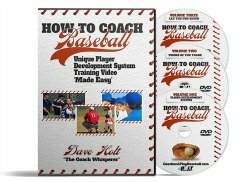 More Baseball Tips to practice at home and on your own!